Hello, and welcome to the first of many match re-caps that’ll be coming from VwS Gaming’s efforts at L.A.S.T. : a massive LCS-style tournament consisting of a full season and live finals! Amateur League of Legends teams like VwS Gaming will be competing in online matches leading towards a top-four spot. These top-four will be decided by a classic league with four divisions consisting of five teams each. The top team of each division will move on to the finals, which will be a 2 day live event at LEc2, which is the League of Legends East Coast Convention from June 12th-13th. The winner of these finals will be given the majority share of a $10,000 prize pool! With the best of luck being wished for VwS, let’s look at how their first match went against Ignition Gaming. Starting off at the picks and bans, Ignition started with bans on Irelia, Hecarim, and Janna while VwS followed with bans on Draven, Blitzcrank, and Morgana. VwS displayed their professionalism here through research, with Ignition’s ADC being a heavy Draven player and their top laner being in-form with Morgana, while Ignition banned against champions that would be able to counter their planned team composition. Ignition went with, from top to bottom, Lulu, Fizz, Braum and Jinx, with Rek’Sai in the jungle. 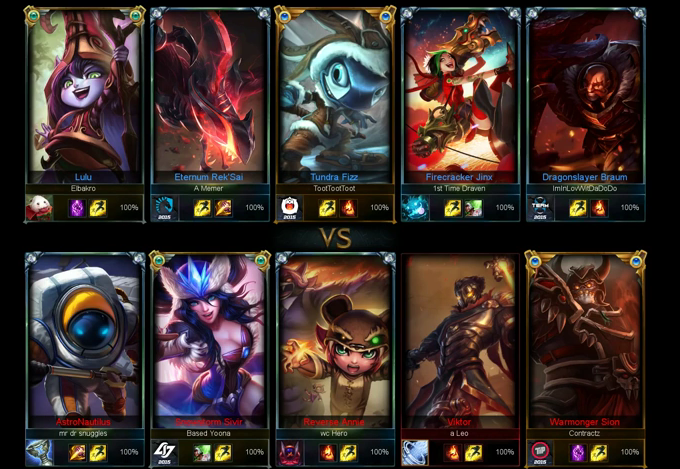 VwS went with, from top to bottom, Sion, Viktor, Annie, and Sivir, with Nautilus in the jungle. It’s a surprise that Ignition didn’t decide to pick Yasuo for their mid lane, given the ridiculous amount of knock-ups that their team possessed. Their team composition is one that would have worked well for early and late-game against VwS, but given Jinx’s heavy reliance on items, as well as Rek Sai’s and Lulu’s, the mid-game is when VwS would be able to show their strength best. VwS’s team composition leaned heavily towards playing as a team, with game-changing AoE skills and/or CC like ults from all of their champions. The game started early with VwS showing aggression in all lanes by harassing and pushing hard, but at a cost. First blood was taken by Toot’s Fizz in the 4th minute as he managed to catch A Leo poking him too far up in mid. Shortly after A Memer and Elbakro both burned their own flashes, as well as Contractz’s, to secure the second kill of the match. A failed invade from Snugglez also almost led to a third kill for Ignition, but instead they pressed their advantage on A Leo lacking flash for another kill in mid and their first dragon. Nautilus’ slow early jungle was a hinderance that Ignition had been making sure to capitalize on, but it was a disadvantage that would not last forever. Contractz went all in and brought Lulu low enough in top lane for A Leo to come around from behind and secure the kill. Almost at the same time, a lane-gank from Nautlius showed off the deadly combo of his ultimate on top of Annie’s, with Sivir’s providing the movement speed required to ensure two kills and a first-tier turret in bot and then mid uncontested due to a successful rotation. Soon after, VwS were free to take dragon with zero pressure from Ignition thanks to the vision control across the bottom river and Ignition’s side of the jungle. With relatively even skirmishing going on in mid and top, the first real teamfight was what would decide whether VwS could maintain their gold lead and remain dominant on the match or if Ignition would regain control of the game. It broke out with Snugglez caught directly outside Ignition’s base walls by ImInLov’s Braum and A Memer’s Rek’Sai, with Toot’s Fizz hopping in and securing the kill after flashing. His focus turned immediately to WC Hero’s Annie, casting his ult and finishing her off to deny the Tibbers cast. However, a huge 4-man Viktor stun/ult combo from A Leo allowed Contractz’s Sion to get his ult and AoE off into the same group, on top of Sivir’s Boomerang and Ricochet. While the only immediate kill resulting from the damage stack was on Braum, the rest of Ignition’s team was brought low enough to allow a mid second-tier turret to be taken down. Ignition attempted to contest it, but a great out-play against Fizz from Based Yoona with Sivir’s Spell Shield and great focus from both him and Contractz led to kills on Jinx and Fizz to make the fight an even trade. The fight VwS were looking for came immediately after. Fizz thought he had caught Snugglez out of position in Ignition’s jungle again, but a quick turn-around from Snugglez and A Leo prompted Contractz to teleport in behind Ignition to engage a 4v4. Fizz went down thanks to a flash-Tibbers from WC Hero, and the focus had already shifted to Rek’Sai leading to a quick two kills. With mid having been shoved by Based Yoona VwS displayed confidence and aggression with a dive past Ignition’s inhibitor to take out Braum and Lulu, and then the first inhibitor of the game. While Ignition managed to pick up another dragon, albeit with pressure from VwS, Sion traded a kill for a second tier turret in top thanks to the stalling. While the map pressure would have played in VwS’s favor for a baron attempt, the advantage was shifted towards ending the game sooner to prevent giving Ignition any chance to get back in the game. A quick grouping in bot by VwS led to a second tier turret, but they had other plans in their mind. A coordinated dive onto Ignition’s AD carry gave him no chance to escape, and the following combination of CC, AoE damage, and intense move speed allowed VwS to make another 4 for nothing exchange on top of their second inhibitor and then the game. VOD from the yesterday's matches can be found below. With a win under their belts VwS will be preparing for their next match, against Inertia Gaming, at 1:00 PM EST on the 4th of April. All match schedules, for VwS and all the other teams, are provided at https://www.esportshq.com/schedule/ Make sure to tune in to the next match http://www.hitbox.tv/eSportsHQ, or read our match recap after the next game! League of Legends is RPG game. The team of this game compete in online matches to win the $10000 prize. Our team of writers at Urgent essay help also participate in League of Legends competition. Many qualified and trained people who were sitting idle and searching for jobs have now found tech support companies a great sector to work in. Thousand of people are losing their jobs. In such a crucial time the tech support companies have emerged as a great relief for people. Today the world is facing a serious problem i.e the economic meltdown. The tech support telephone numbers also helps callers save valuable time and money. The callers need not hold for long to get any information since they provide the anticipated services within a minimum timeframe. They do not provide services to their callers through any recorded or programmed sources. We are earning from games while playing it online. SingaporeAssignmentHelp.com always offer best <a href="https://www.singaporeassignmenthelp.com/assignment-help/">assignment help</a> support to singapore students of at fair rate before expiration of time. Students of singapore having faith on our expert writers because they know our writer provides best and quality assignment support to the students. SingaporeAssignmentHelp.com always offer best [url=https://www.singaporeassignmenthelp.com/assignment-help]assignment help[/url] support to singapore students of at fair rate before expiration of time. Students of singapore having faith on our expert writers because they know our writer provides best and quality assignment support to the students.